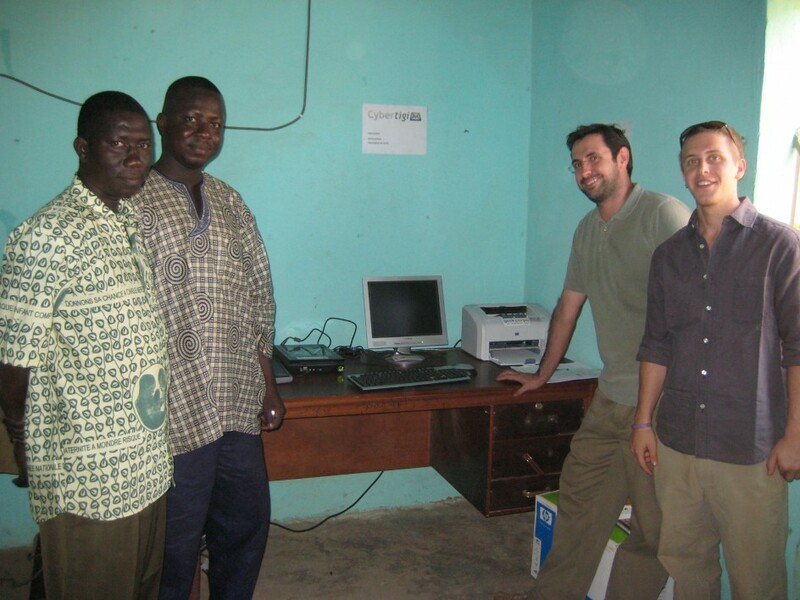 I spent two years in Mali from 2005 to 2007 such as the Country Director of Geekcorps which is a non-profit organization that sends people with technical skills to developing countries to assist in ICT infrastructure development. At Geekcorps, we built a couple of innovative technical solutions such as an open FM transmitter, a CanTV, an offline wikipedia, a bottleNet, DIY solar panels, a rural information center named Cybertigi or a digital kiosk named la Source. We had a nice office located in the Bamako hippodrome district with a lab and six rooms to welcome fellow geeks. I was lucky enough to run the office after Ian Howard and Matt Berg who had already built amazing adapted ICT solutions for Mali. 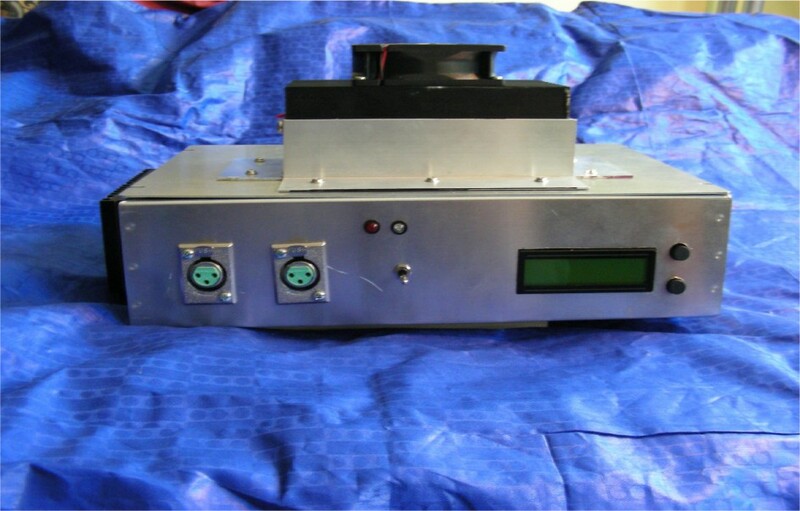 The OpenFM was a 150W transmitter designed by Frédéric Renet for use on 12 Volt solar panels. It had been built to be suited for harsh environments because its sealed case keeps dust and moisture out, while a small external fan and heat conductive case keeps it cool. Placement of heat-generating components outside the case also keeps the device cool. This transmitter had an overall power consumption of less than 21A at 12 Volts and a transmission power of 150 Watts. The transmitter was designed to be easy to build with a limited set of tools, requiring only a small metal saw, a power drill, a file and a soldering iron. It does require electrical engineering knowledge and equipment to test it properly. In northern Mali there are television sets powered by 12 Volt car batteries, but there is almost nothing to watch. 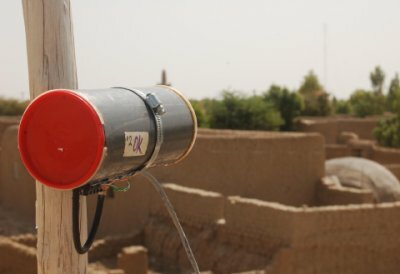 With the CanTV project, Geekcorps had helped local radio stations stream video content to the local community over WiFi. The radio station, which rents these units out, benefits from a new monthly revenue stream while the villagers benefit with an improved source of news and entertainment. 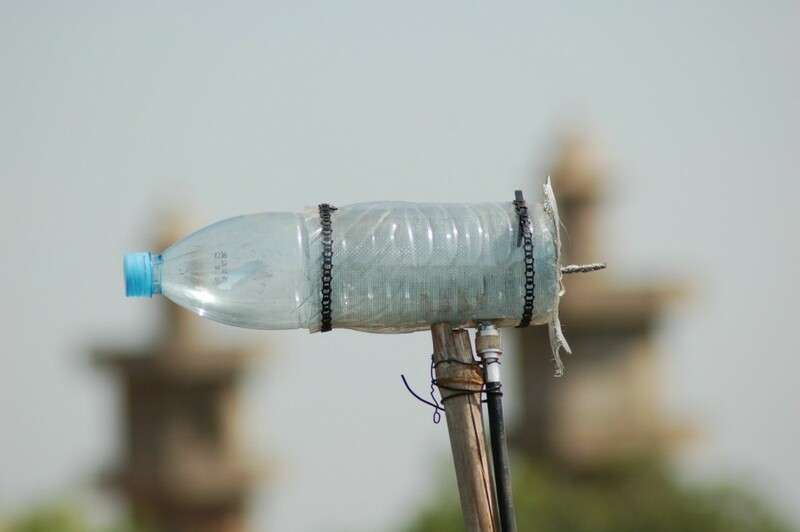 One goal of the CanTV project was to make it possible to build the CanTV receivers or TV cantennas (antennas built with cans) using locally available parts, with the exception of the $25 audio/video receiver currently imported from Canada. Also, the TV cantennas had been designed so that a local technician can quickly learn how to install them without special tools. The first version on the offline Wikipedia was named Moulin and mainly developed and supported by Renaud Gaudin a fellow Geekcorps volunteer. It was possible to access Wikipedia content without pictures from a CD. It was very useful for people, in remote computer centers with sporadic connexions, to access information. Then, came a new version named Kiwix (http://www.kiwix.org) which was an offline reader for web content. It was software intended to make Wikipedia available without using the internet, but it was potentially suitable for all HTML content. Kiwix made Wikipedia available in schools, universities and libraries which can’t afford a broadband Internet access. An appropriate connector (N-type female bulkheads are great but not so easy to find). 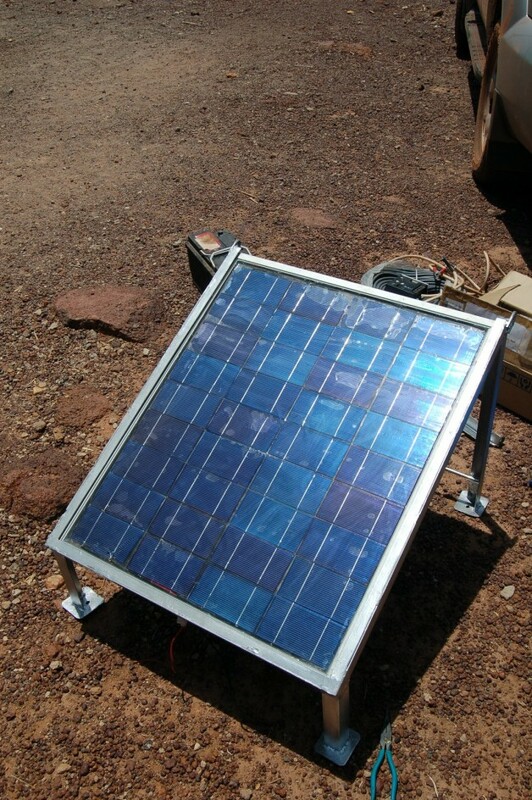 We also built our own solar panels from damaged photovoltaic cells. Indeed, an American company sent us photovoltaic cells with small damages but still in working conditions. We were able to build our own solar panels to power our Cybertigi center, radio stations and satellite radio receiver. La Source was a digital kiosk, built with an old computer and able to provide digital content on a USB stick such as music, movies and books. It was possible to navigate in the menu with only three buttons and upload selected contents on a USB stick. 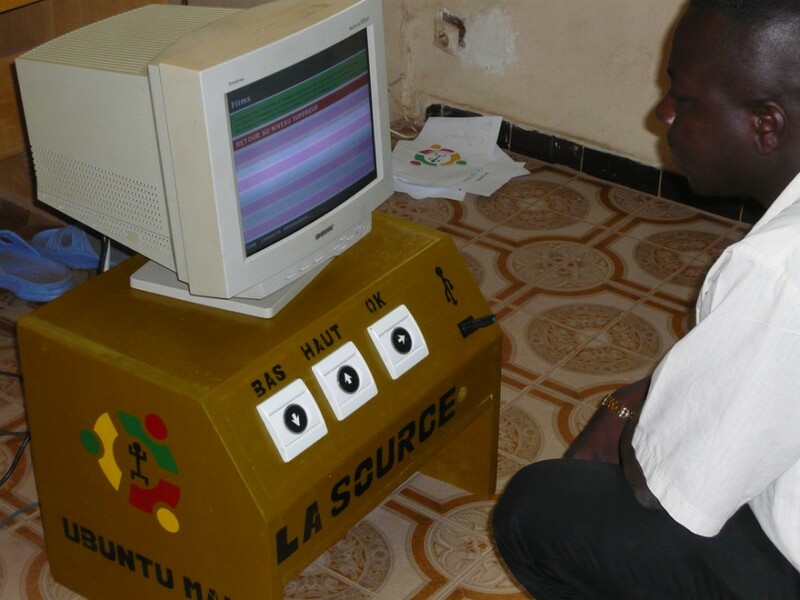 The first prototype was set up at the Bamako market then a couple of la Source were installed in Mali.